Online Rock Salt, the UK’s leading supplier of bagged rock salt, is also able to supply white marine salt. Whilst our rock salt supplies come from a UK source, white marine salt comes from sunnier climes. M.D. Ian Mercer recently visited one of our white marine salt suppliers in the sunny Mediterranean to get a better understanding of how this salt is produced. 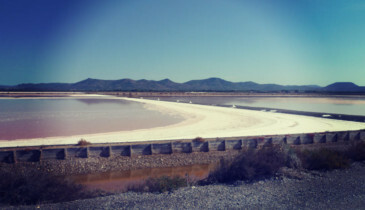 The production of white marine salt for domestic and industrial use is an ancient one, and in many respects the basic elements have remained the same for thousands of years – saltwater is evaporated under the hot sun to create a purer salt that can then be used for a variety of purposes. 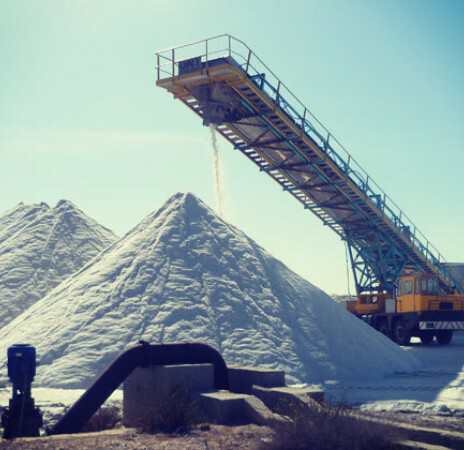 However, modern white marine salt production uses a more advanced system of these ancient methods, producing the white salt that Online Rock Salt sells. The first stage is evaporation. Sea water is placed in salt lakes, directly under the hot sun. The water slowly evaporates, leaving behind salty deposits. This is a relatively quick process, but the salt left behind isn’t pure enough for commercial use. As such, the salt deposits are then moved to the crystallisation bays, where it stays for five years! Small amounts of water from the shallow lakes are added to make the salt more concentrated, making up to 1cm of salt per week. The salt levels will eventually reach 80cm by the time the crystallised raw salt is removed from the bays. The salt’s transformation from sea water to raw salt attracts wildlife. The pink edging around the evaporation bays is artemia salina, an ancient species of brine shrimp that dates all the way back to the Triassic period. These shrimp are one the main pillars of the diet of the flamingo, and is what gives the bird its flamboyant pink colour. 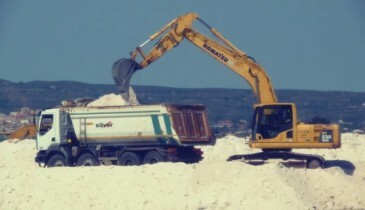 Once the salt is suitably crystallised into raw salt, it is taken to treatment areas to transform it into the product that we would recognise as white marine salt, as raw salt is not suitable for industrial use. The salt is washed to remove Magnesium, and the product that’s destined to become salt for de-icing is put through a screener to ensure that it’s screened to 6mm. The final touch to make the white marine salt we sell is adding an anti-caking agent. The anti-caking agent KFeCN – potassium, iron, carbon, nitrogen – is the most common in the industry and stops the white marine salt from clumping during transit. A road leads from the salt bays to the dockyard, where large ships wait for the salt to be loaded. They can load 350 tonnes per hour, and each boat can take 3000 tonnes in total. These boats travel across the Mediterranean and through the Gibraltar Straits, eventually ending up at the Ellesmere Port docks on the Mersey, a short distance from Online Rock Salt’s base in West Lancashire. So there you have it! A quick insight into the process of transporting sardinian white salt to the UK, ready to be distributed all over the country.